One of J.R.R. 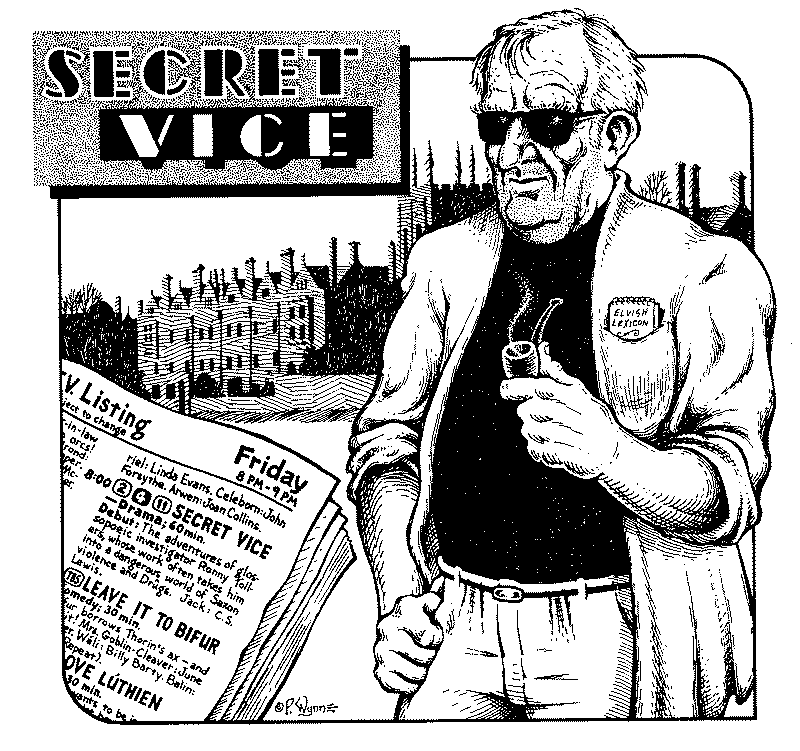 Tolkien's less famous works is A Secret Vice, a lecture first presented in 1931, and reprinted as an essay in The Monsters & the Critics and Other Essays. The “vice” to which the essay refers is the peculiar practice of creating languages, not as a code, but as an art form, perhaps to be shared for the use or appreciation of interested parties, as one would share a painting or manuscript. The word glossopoeia is a coinage derived from Greek, meaning “the making of tongues.” As Tolkien explains, the creation of languages offers both intellectual and aesthetic satisfaction, but at the time he wrote, there were few such creations known to the public. As we will see, this situation has changed considerably since that time. In this article, we will consider the genesis and effects of the three best-known glossopoeic works in chronological order: the international language Esperanto; the Elvish cluster of languages; and tlhIngan Hol, better known by its English name, “Klingon”. Unu Ringo en mallumon ilin gvidas kaj katenas. This example shows a few of Esperanto's interesting features. The vocabulary is largely derived from Latin roots (reg-, “rule”), but has some Germanic or English roots like ring- in the mix as well. The word mal-lumon for “darkness” demonstrates how the vocabulary is extended by using affixes; the word can be literally analyzed as “un-light”. The number of Esperanto speakers grew steadily after its publication. A number of literary translations, as well as original articles, prose, and poetry, appeared during the next twenty years, and the first international congress conducted entirely in Esperanto was held in France, in 1905. Among the people who eventually learned Esperanto to the point of being able to write in it was a young English Boy Scout named John Ronald Reuel Tolkien. In 1909, he wrote a small sixteen-page notebook, the Book of the Foxrook partly in Esperanto, describing a “privata kodo” for scouts. This private code consisted of a rune-like alphabet and a set of ideographs and represents the earliest known alphabet invented by Tolkien. Here Tolkien, echoing some of his thoughts in A Secret Vice, is observing that the creation of a language is more than the simple creation of a tool or code; it is an endeavor that must give not only intellectual satisfaction, but aesthetic pleasure in the arrangement of sounds and meaning. Indeed, Zamenhof evidently spent a fair amount of time “taste-testing” his developing language before deciding on the words and sounds that would finally be part of the language. Volapük, Esperanto, Ido, Novial, &c &c are dead, far deader than ancient unused languages, because their authors never invented any Esperanto legends. Nevertheless, it is worth observing that, of the dozens of prospective international language projects that have appeared in the last 150 years (including the three others Tolkien mentioned), only Esperanto has continued to grow substantially after the death of its creator. Estimates of the number of competent speakers range in the hundreds of thousands, and a Google search for “Esperanto” produces more than 850,000 matching Web pages. There is even an Esperanto translation of The Lord of the Rings in print. Arguably, Tolkien was wrong about Esperanto — but for exactly the right reason. Unlike the other languages he mentions, Esperanto does indeed have its own mythology. It does not consist of magical legends, but is a kind of political mythology of hope, a shared belief among its speakers that the world would be a better and friendlier place if everyone in the world could communicate across borders as easily as Esperantists do, in a language that belongs to no single nation or people. This notion, called the interna ideo by Esperantists, is sometimes a source of embarassment. Nevertheless, this idealism pervades much of Esperanto literature, especially from the first fifty years of its existence. Many, if not most, biographies of Zamenhof tend to mythologize his life, treating the behavior of some of those who tried to gain control of Esperanto's development with the sort of language usually reserved for the likes of a Lucifer or Sauron. So, if Esperanto is not dead, it is precisely because there are legends and myths connected with the language. You must remember that these things were constructed deliberately to be personal, and give private satisfaction — not for scientific experiment, nor yet in expectation of any audience. The Elvish languages, and Qenya (later Quenya) in particular, were thus a way for Tolkien to express his individual taste in languages. As has been discussed many times elsewhere, Qenya was strongly influenced by Tolkien's attraction to the Finnish language. In early Qenya for example, the word for “twenty-three”, his age at the time, was leminkainen, quite similar to Lemminkäinen, one of the major heroes of the Finnish epic, the Kalevala. Similarly, Goldogrin, the Gnomish language of the Noldor, was heavily influenced by Tolkien's love of Welsh. There is no question that the Elvish languages represent the most complicated such creation ever seen. Not only did Tolkien devise Qenya and Goldogrin, but also a common proto-language from which those two were (within the mythology) derived, and hints of several other related Elvish dialects. … for perfect construction of an art-language it is found necessary to construct at least in outline a mythology concomitant. Not solely because some pieces of verse will inevitably be part of the (more or less) completed structure, but because the making of language and mythology are related functions … The converse indeed is true, your language construction will breed a mythology. So closely bound were the languages and myth that it is impossible to tell where a phrase or word in the language inspired a new part of the story, and where the languages were expanded or changed to suit the tale. Unlike a practical language like Esperanto, in which stability is (as Tolkien himself observed) critically important to its goal of widespread propagation, Tolkien's languages were dynamic and changed as his own tastes changed and, indeed, as his mythology of Arda itself grew and evolved. “There is no finality in linguistic invention and taste,” Tolkien wrote in 1932, and his own languages demonstrated that dramatically. But Tolkien's private game took a different turn when his fiction was published. In The Hobbit, there are a few hints of the Gnomish language — names like Orcrist, Glamdring, and Elrond, with English meanings given for the two weapons. The Lord of the Rings, however, entailed the publication of dozens of such names, and examples of complete sentences and even poetry in both Quenya and Sindarin. In fact, the names and relationships of Sindarin and Quenya themselves changed during the writing of the novel, another example of how the mythology and languages influenced one another reciprocally. The publication of so much Elvish had two profound effects. The first was that Sindarin and Quenya became essentially “frozen”. With few exceptions, the names and interpretations that had appeared in print were no longer subject to revision, and had to be considered definitive. To Tolkien, this was just a new feature of the game. Previously, if a word was changed or added, the existing languages were retroactively modified, sometimes extensively, to accomodate the change. But after publication, whenever he devised a new grammatical construct or vocabulary element, he felt bound to make sure it conformed to the published material, even when this was inconvenient. Er-chorf hain toged bain a din fuin hain nuded. Perhaps the most profound effect of the prominence of the Elvish languages in Tolkien's hugely popular work was that it made glossopoeia respectable. Indeed, it seems that fantasy and science fiction works in the post-Tolkien milieu practically require the appearance of some exotic language spoken by alien or mythic races, or at least some systematic phonological structure in the names of people and places. One can now find several Web pages devoted to glossopoeia, or “conlangs” as such constructed languages are sometimes called. It was in this post-Tolkienian world that Paramount and Gene Roddenberry created the Star Trek motion pictures of the 1970s. The first film had a short subtitled dialogue among the Klingons, as well as a snippet of Vulcan dialogue, but these were ad hoc creations, not part of any systematic language. For the 1982 Star Trek film, The Wrath of Khan, the studios were looking for a linguist to construct a few lines of Vulcan dialogue and recruited one Dr. Mark Okrand, a linguist with whom a producer's secretary happened to be acquainted. It represented a few days' work, but the producers called upon Okrand again for the somewhat more extensive Klingon dialogue in the 1984 film, The Search for Spock. Unexpectedly, and perhaps himself inspired by Tolkien's work, Okrand created an extensive phonology, grammar, and lexicon for the Klingon language, and even retro-fitted the haphazard speech from the first film into his language as “clipped” Klingon, a battle dialect. The first edition of The Klingon Dictionary was published in 1985, and has had several reprintings (including updates based on additional material appearing in later films). Hoch qemmeH 'ej ramDaq bIH baghmeH wa' Qeb. With the many harsh aspirants and glottal consonants, the Klingon language would likely have struck Tolkien as an Orkish “brutal jargon,” and indeed does have superficial phonological resemblences to Black Speech. The Klingons, however, are a much more richly depicted culture than Orcs, and have captured the imagination of many viewers. Consequently, The Klingon Dictionary has sold hundreds of thousands of copies, a figure which usually leads to rather inflated numbers claimed for the number of Klingon “speakers”. There are instructional language tapes available, and the Klingon Language Institute even produced a Klingon version of Hamlet not long ago, largely as a result of a joke in a Star Trek film. In the case of Klingon, the popularity can be attributed to the mythology that produced it: the mythical future world of Star Trek. While only a small number of people can actually speak it fluently, it is nearly certain that there are a large number of fans who can, with the aid of the dictionary and grammar, construct a grammatical Klingon phrase or sentence, or who have memorized some of the “useful phrases” such as “Surrender or die!” (bIjeghbe'chugh vaj bIHegh) — almost certainly more than the number of people who can do the same with Quenya or Sindarin. All three of these invented languages have had considerable success in their own rights. Perhaps to understand why, we can compare the “cultures” associated with Esperanto, Elvish, and Klingon. The stereotypical Esperantist is a slightly naïve idealist who sees Esperanto as a way of increasing the brotherhood of mankind through improved communication, and tries to correspond with pen-pals in as many countries as he or she can. The stereotyped student of Elvish is inspired by a language in which one routinely says things like, “a star shines on the hour of our meeting,” and may write Elvish poetry filled with natural imagery about oceans, forests, trees, rivers, and clouds. The Klingon speaker enjoys the dark irony of a language in which the standard greeting translates as, “what do you want?” and even “I love you” is expressed in a guttural phrase like qamuSHa'. While this is obviously a too-facile characterization, we can see that each of these languages fulfills some need (albeit not necessarily practical) of its community: aesthetically, politically, literarily, or indeed, mythically. They enjoy unusual success out of the hundreds of glossopoeic inventions that have doubtless occurred in the past, because they touch some part of the human linguistic facility in ways that other efforts have not. There are many sources on the Web for information about Esperanto. In North America, a good starting point is The Esperanto League for North America, while those in other countries might look at The Multi-lingual Esperanto Information Center. Two good URLs to find out more about Elvish are Resources for Tolkienian Linguistics and Ardalambion. The leading organization for Klingon is The Klingon Language Institute. There are dozens of other conlangs that you can read about on the Web, including the logical language Lojban and the Tsolyani language from the fantasy role-playing world of Tekumel. One useful starting point is Richard Kennaway's Constructed Languages List, which has an astonishing number of links and thumbnail descriptions. Finally, the author gratefully acknowledges the article by Patrick Wynne and Arden Smith, Tolkien and Esperanto, which appears in issue 17 of the journal Seven. including Zamenhof's own translation of Shakespeare's Hamlet. The first page of this notebook was exhibited by the Bodelian Library as part of a Tolkien centenary exhibition in 1992. An important source of information about Quenya nouns is the so-called “Plotz Declension”, a letter Tolkien wrote to Richard Plotz showing standard Quenya noun declensions. although many agree that the play is better in the original Esperanto. The head of the Klingon Language Institute has said that he does not know of a hundred people who can speak the language fluently, although the criteria for judging fluency are necessarily nebulous. If you really like stereotypes, the Esperantist is a 1940s-style leftist; the Elvish scholar is a 1960s hippie, and the Klingon speaker is a biker in black leather. Special links referenced in this article.